I’d suggest that it is Ms. DeVos who “does not have all the answers,” and in fact isn’t really sure of what the questions are–but more on that in a minute. Last week saw Middletown Schools unveil the district’s first food truck, part of a $225,000 program to feed the district’s needy students by going to them on non-school days. The giant, brightly colored truck will travel to some of Middletown’s low-income communities this summer to deliver free lunches to children and teens who during the school year depend on such meals from their school cafeterias. 1. 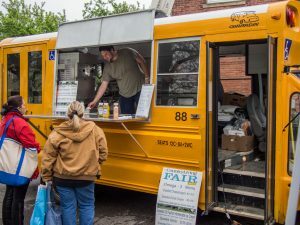 It’s important to note that these are traditional public schools in Ohio providing these food trucks…not charter schools, or private schools, or even religious schools. Because traditional public schools are committed to serving the communities in which they are located, and are governed by locally-elected school boards–not charter management corporations, or privately-appointed boards of directors. 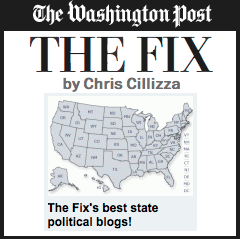 Remember this the next time some ed reformer makes a snide comment about “children being trapped in failing public schools because of their Zip Code!” Zip codes aren’t evil–they describe the communities in which we live. Instead of suggesting that families move their children out of their Zip code to find a “better” school, why doesn’t the Secretary of Education work to make sure that every public school has the resources needed to offer the high-quality education that every child deserves? Instead of trying to invest more of our tax dollars in to a group of schools that are actually failing, in front of our very eyes? Isn’t that her…you know…job? 2. These food trucks are part of school meal programs that are federally subsidized. Remember this the next time some conservative makes a snide comment about “government schools.” The government is not some evil machine that is attacking our freedoms. It’s just people, like you and me…and most of these people are just trying to do their jobs, which have to do with serving the public–in this case, providing nutritious meals to children outside of normal school hours, and after the normal school year has ended. 3. 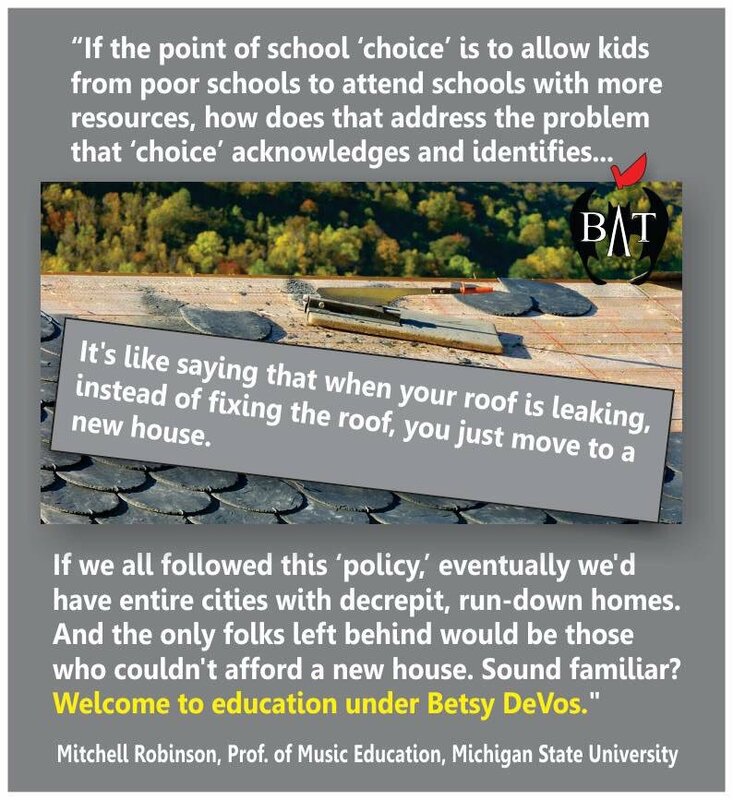 While Ms. DeVos seems to think that our public schools are some sort of monolith, and based on a one-size-fits-all model that has survived as an artifact from the pre-industrial revolution agricultural calendar, nothing could be further from the truth. The diversity among our public schools is one of the true strengths of the modern educational system. It’s really not very hard to find public Montessori schools; arts, science, and language-immersion magnet schools; early childhood education centers; schools functioning on extended- , “year-round,” or balanced-calendars; schools that offer career and vocational training; and schools offering the International Baccalaureate model–often all within the same public school district. Of course, in order to find these schools you’d need to actually visit a public school or two. 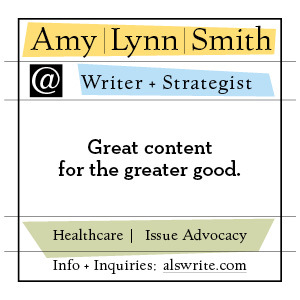 So, in spite of Sec. DeVos maintaining that our public schools are “failing” because they are not “innovative,” I have yet to hear a single innovative thing that she thinks charter or private schools are doing that public schools haven’t already done. It is not “innovative” to cut funding for children with special needs. It is not “innovative” to increase funding for charter schools that educate fewer than 7% of our children while cutting funding for traditional public schools that educate 90+% of kids. It is not “innovative” to suggest that public schools are “failing” and large school districts (i.e., Detroit) should simply be shut down. It is not “innovative” to demand billions of tax dollars for private school vouchers. It is not “innovative” to hold lotteries for school admissions. It is not “innovative” to mix religion and public education. It is not “innovative” to ignore the impact of class size on student learning. It is not “innovative” to demonize teachers unions and their members. It is not “innovative” to limit your school visits to charter, private, and religious schools. It is not “innovative” to hire uncertified or unqualified teachers. It is not “innovative” to pay teachers less, and administrators more. It is not “innovative” for the Secretary of Education to welcome massive cuts to the federal education budget. 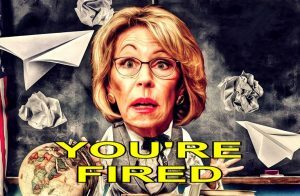 Sadly, at this point what would be “innovative” is to have a Secretary of Education who had ever studied education, been a certified teacher, or had ever taught in a real public school. Rather than continue to make these disparaging remarks about schools, teachers, and the press, what would be “innovative” is for Ms. DeVos to go out and actually listen to some public school teachers, students, and parents. 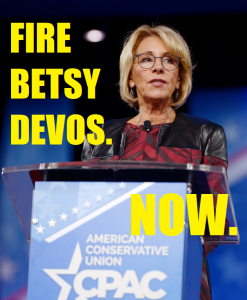 She’d quickly find that her preconceived notions about our schools are based on equal parts ignorance and arrogance; that the vast majority of Americans are very satisfied with their children’s public schools; and that our country’s public school teachers are doing magnificent work under very difficult conditions–conditions that Betsy DeVos has been a major force in funding, creating, and implementing. Want to do something “innovative” that would truly help our nation’s children, teachers, and schools, Ms. DeVos?